Taking care of your Motorcycle tires is very important. Just think about the tire for a second. It's the only thing that connects you and your bike to the road (hopefully). This connection is super important so we need to be very aware of our tires to ensure that connection can keep us safe. If you are riding, you need to check your tires. This is even more important in the rainy season of Fall. Little things like dew, water, and even leaves are enough to make the roads very slick. Imagine if your tires aren't in the best condition; then these conditions are even worse for you. When a tire is worn is loses its ability to dissipate water. This means as you ride through the wet road, your tires aren't kicking away the water like they should, so you're just driving in actual water. If this was the only problem with worn tires in the water, it would still be enough to warrant a change. But there's more. These worn tires have less handling abilities and are much more susceptible to punctures. So, now we know that worn tires are very bad (and you probably already knew that) especially in the rain, we need to know how to check the tires to make sure they're in working order (and then replace them if not). Before you ride, visually check your tires. Make sure there is nothing clearly wrong with them. A lot of tire problems are overt, but you need to look at them to find them out. Next, check the sidewalls for any cracking or breaking. These signs can pop up before the tire starts to perform badly, but it is a sign of things to come. Some companies sell dressings or repair kits for the sidewalls but generally these do not do anything at all. Tire pressure is a thing that should be checked very often, especially because it is so easy to fix. When your tire is flat, you lose out on a lot, like carrying power. But you also lose out on handling and control. Also, a tire with low air pressure can suffer punctures under normal circumstances. When you do go to check the air pressure, make sure you're doing it when the air is cool as warm air can throw off your readings. 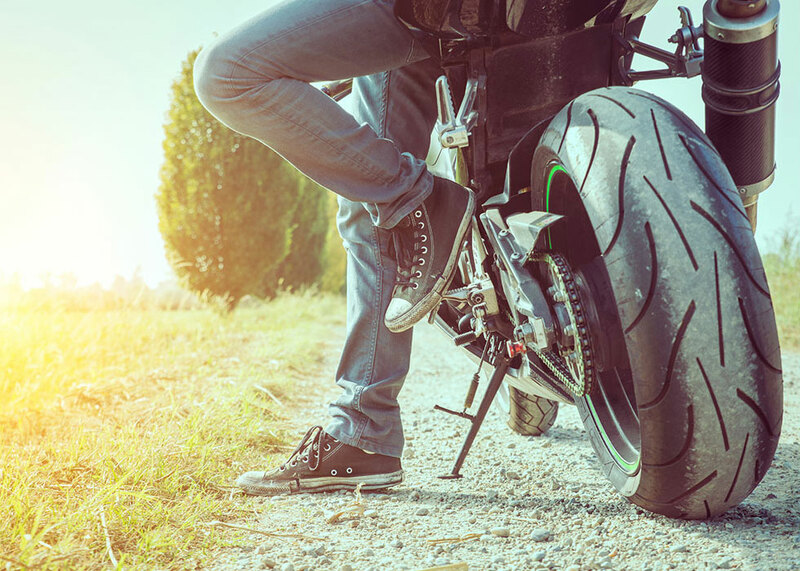 If you're storing away your motorcycle, you still need to do a few things to make sure the tires remain in good condition. The biggest mistake to make is to let the tires experience a lot of temperature changes. These can make the tires weak and break right after storage. Tires and tire care is all up to you. Skipping out on Tire Care can take perfectly good tires and make them weak and bad. When you stay on top of it you get to save money and save yourself a headache or two. Now your money can go to your bike and your time can go to riding.